In Summer Camp Island Bubble Trouble Game: You need to help Oscar and Hedgehog from the animated series, Summer Camp Island, solve the Bubble Mystery and pop your way to victory! You are going to shoot bubbles from the bottom to the top. With the goal of hitting groups of bubbles that are of the same color or create them. And you have to give it your best so that you eliminate them all, without letting them fall down. Because if they touch the bottom of the game screen. You will have lost and be forced to start all over again. Start the fun right now. And make sure to stick around and play even more of our games, since you won’t be disappointed! 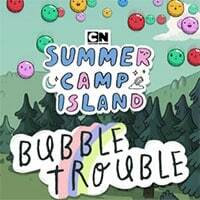 Enjoy and have fun in playing Summer Camp Island Bubble Trouble Game. Good luck.